Waking up to frosted cars was a bit of a worry last Sunday morning as there was an 8 mile paddle planned. Fortunately on arrival at Adderbury the sun was shining and we couldn't have had a nicer setting to begin the trip. Five of us in all braved the cold. Penny and I were in Kayaks, Rob, Penny and Philip in open canoes. Due to a fair amount of rain, the river had quite a current and was faster than anything I had experienced before. There were also several more obstacles in our way than Penny and Philip had encountered previously on this stretch of river. 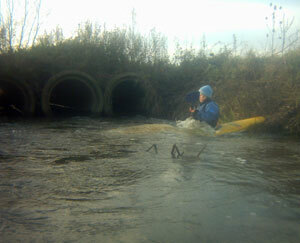 Penny took the opportunity to paddle ahead and guide us step by step, practising her coaching skills. 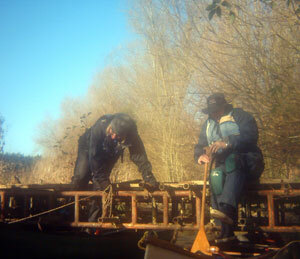 Only 10 minutes or so after setting off, we had to get under a tiny scaffolding bridge. Penny and Rob expertly guided there canoe under while they climbed over the bridge. We also slid down two weirs and I was able to seal launch off the bank. 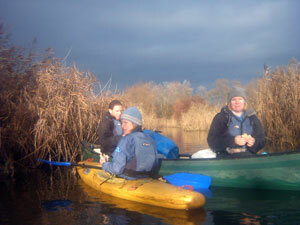 In all, the paddle to Somerton took 5 hours and it was a relief to everyone when we reached the end moments before sunset. For me personally it was quite a challenge but a really good paddle.